Back across to the airport first thing to charm my way through customs, managed to speak to a girl this time instead of the grumpy old bloke from yesterday. She signed and stamped everything with no problems and I was back across at the cargo area by 9:30am. Spoke to another girl there who was very helpful and said that I could assemble the bike there in front of their office and they could dispose of the crate for me for $A30. The best part were the fees for handling and storage, which I was starting to get a bit nervous about given that the bike had been sitting there since Friday, came to an amazing total of only $A25!! Hell yeah! I unwrapped the bike, connected the battery, put on the `bars (all with a bit of a crowd watching) and pushed it around to the servo which was only 50m away and filled it up with 34l of Japans finest hi octane. 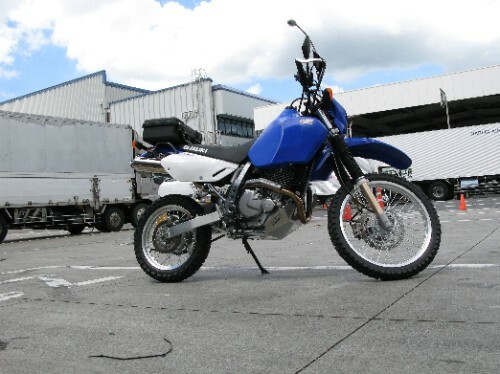 Started first go, as you`d expect from the ancient engineering of the DR650, and I was away. I was wearing all the safety gear of course, T-shirt AND jeans for my first ride in another country. Did I mention how hot it is here? It was only a 10 minute ride away and there were no wheelstands or stoppies so I made it back to the hotel ok.
Now I just had to work out what I`m doing for the next 2 weeks!!? ?